Last week we looked at how the healthcare industry (and vendors) would enjoy financial advantages of using Artificial Intelligence (AI), computer vision, IoT and more. 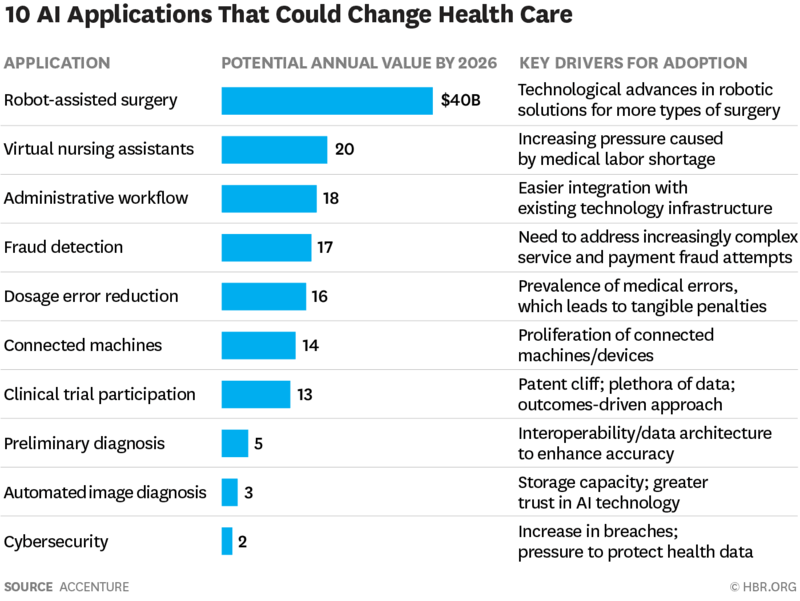 There’s no doubt AI is changing the world in ways both tiny and huge, so let’s look a little more closely at how it is being leveraged specifically in healthcare. Anomaly detection. Anomaly detection is the act of identifying an event or item that doesn’t conform to others in an expected pattern. Your bank may call you now and then to ask about a specific charge on your credit card because it was unlike most of your purchases. Therefore, it was flagged so customer service would call (or text) you to ask if you made the purchase or if perhaps it was a fraudulent transaction. In healthcare, medical issues or textual errors can be identified and flagged. It has been able to improve image analysis efficiency by flagging specific anomalies in an image so that a radiologist can take a closer look. This gives radiologists more time to focus on reviewing those anomalies, saving time and improving patient care. Another way in which anomaly detection is used is to monitor and detect abnormal activities to mitigate insurance fraud and data breaches, like the credit card example above. Robotic surgery. In 2017, the Smart Tissue Autonomous Robot (STAR) demonstrated it was more precise than expert surgeons and damaged less of the surrounding flesh. AI is also improving surgery outcomes by analyzing pre-op data and helping surgeons during the procedure by providing new surgical techniques, resulting in fewer complications and shorter patient hospital stays. Dosage accuracy. Determining medication dosing relies on guidelines along with educated guesswork, according to HBR. Dosing errors account for up 37% of all preventable medical errors, which can be reduced significantly by combining those guidelines with improved data and analysis. As AI is increasingly used for this, incorrect dosing – and its devastating effects – could be a thing of the past. Virtual assistance. Virtual nursing assistants can potentially reduce unnecessary hospital visits and lessen the burden on medical professionals. AI-powered virtual nurses are being used by healthcare organizations to ask patients questions about their health, assess symptoms and give them care suggestions, giving healthcare professionals more time to focus on critical care. Backoffice efficiency. Healthcare costs are through the roof, so AI is being increasingly applied to correct and improve inefficiencies in the backoffice such as improving workflows and eliminating time-consuming tasks such as writing chart notes and ordering tests and prescriptions. Automating administrative tasks frees up care providers to prioritize urgent matters and saves time on routine tasks. Identifying diseased cells. Teaching a computer to better recognize what something looks like is what the industry calls deep learning. It is used for such technologies as speech recognition and it gets more accurate the more the system is used. The same process is used to identify cancer cells. Surgeons rely on biopsies to decide what tissue to remove, so accurate biopsy identification and analysis is crucial. By feeding thousands of images of cancer cells as well as examples the computer was prone to make a mistake on, an AI and machine learning-powered computer continually improves in accuracy. With improvements in scanning, storage, performance and algorithms, cell identification is going to be a capability to watch in the years to come. Helping avoid illness. One of the most exciting ways AI is being used is in conjunction with the Internet of Medical Things (IoMT) in consumer health applications. These apps help people get and stay healthy so they don’t need to see a doctor as often by encouraging healthy behavior by tracking steps and exercise time, reminding people to drink more water, and counting calories, sodium and sugar for better diet practices. These apps are also useful for doctors so they can understand the day-to-day behaviors of their patients. Training. AI computers are being used to provide various scenarios to trainees and challenge them in ways that a human being cannot. With access to thousands of challenges and the ability to learn from prior responses, trainees will continually be challenged. They can also train via smartphone, computer or tablet. AI is getting more and more sophisticated, able to save costs and do what people do – and some they can’t – more efficiently and quickly. The possibilities are endless in healthcare, just like it is in our everyday lives. Above are just a few of the benefits the healthcare industry and patients enjoy.